Medill junior Cassie Majewski and Weinberg senior Sterling Harris rehearse their tap duet for “[Re]Act.” Fall Dance Concert that will premiere in the Virginia Wadsworth Wirtz Center for the Performing Arts Nov. 9. Earlier this fall, Sterling Harris was posed with a performer’s predicament — how do you dance the role of a shadow? After several weeks of rehearsal, the Weinberg senior finally came to the conclusion that he just needed to let go and let the dance do the work. Harris will perform a tap duet as part of the many numbers of “[Re]Act,” this year’s Fall Dance Concert. The concert, which premieres at the Virginia Wadsworth Wirtz Center for the Performing Arts on Nov. 9, is produced by New Movement Project. 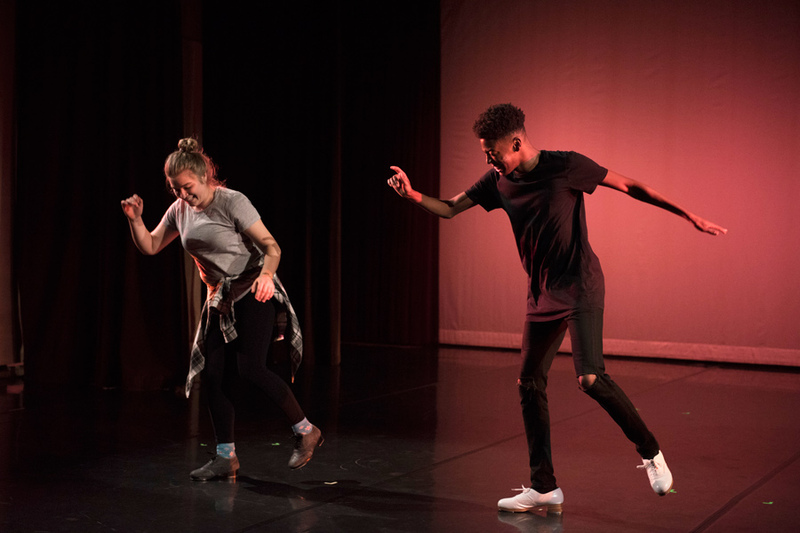 It will feature 11 numbers choreographed by students in the School of Communication’s dance department who were selected by a panel last May, co-producer Kylie Stover said. Stover, a Communication sophomore, said the performance will highlight a variety of genres — from ballet to modern and tap — and that each piece tells its own story. This blend of genres made programming the overarching show challenging due to the different energy levels of each piece, Stover said. “Me and My Shadow,” Harris’ high-energy tap number, was choreographed by Communication senior Anna Backer. Harris is the dancing shadow to Medill junior Cassie Majewski’s human form. Harris noted that the piece is uncharacteristically theatrical for tap, as it features a definite storyline. Backer said she did this intentionally as a way to connect with the audience. Backer’s piece is also unique due to the lack of background music until the end of the number, she said. She added that she did this as a way to experiment with the different sounds created by the taps on the shoes. Backer said she attempted to be very collaborative in choreographing this piece; if either of the duet’s dancers came up with something she liked, she would put it into the number. Communication senior Rachel Traisman expressed a similar sentiment for her piece, which draws from both ballet and ballroom practices. She said a challenge in choreographing a duet is finding ways to demonstrate to her dancers the complex moves — such as lifts — that require two people to execute. Despite the challenges, Traisman said she’s found working as a choreographer a rewarding and liberating experience. Communication Prof. Jeff Hancock, the show’s faculty adviser, said he only helped polish a few transitional areas as the students were largely autonomous in their creative processes. Hancock said he’s been very impressed with how well the student choreographers have packed so much emotion into short, six-minute dances, as well as how they’ve kept the material fresh in every performance. Monday was the first time the company ran the entire production, and Hancock said he cannot wait to get an audience in the space.